Just like the lousy new Apple maps, this highly touted app (HERE, by Nokia) has failed my litmus test – including the street that I work on. Now granted it is street in a smallish place, but it has been “here” for at least 4-5 years. Google maps has had it since it became a street. Now I don’t trust you in other places. The micro-apiary is now buttoned up for the winter. I think my bees are smart enough to know where “home” is – but sometimes you need to be obvious when you are dealing with user experience. Though the regular entrances are on the bottom (landing pad), they can easily become blocked by snow (and dead bees). And, as the bees eat their way up the structure over the course of the winter, it is essential to have and upper entrance available to them. Those are the ones you see circled in spray paint. FYI – the one on the right has two entrances, as it is two “Nucs” wrapped together to keep each other cozy. The material used for wrapping is black 15 lb. felt/roofing paper. A Winter Insulating Homasote Board is the topmost item on the stack of hives to absorb excess moisture. 1/4″ T-50 staples keep it all in place. 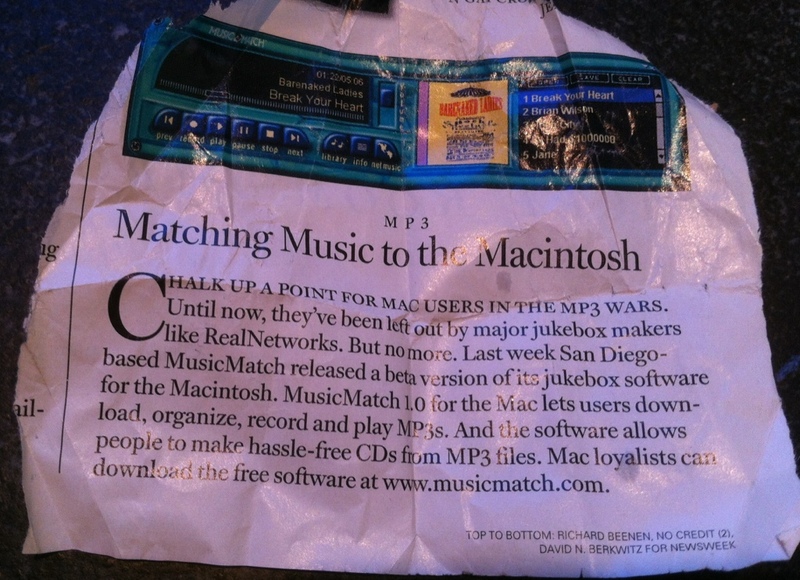 An old clipping found while cleaning harkens back to an era that was surprisingly recent – when music on the Mac (and frankly most computers) was a pain.